(Inside Science) -- For many decades, scientists, fisherman and oceangoers have known there is plastic in the ocean. In 2014, scientists estimated that the ocean holds more than 5 trillion pieces of floating plastic, which together weigh more than 250,000 tons. That’s more than twice the weight of a fully loaded aircraft carrier. Earlier this year, researchers from HAUSGARTEN, an Arctic deep-sea observatory, reported that plastic and other human-made debris can be found on the Arctic Ocean floor and the amount seems to be increasing. But the extent of pollution on Arctic beaches was still unknown. 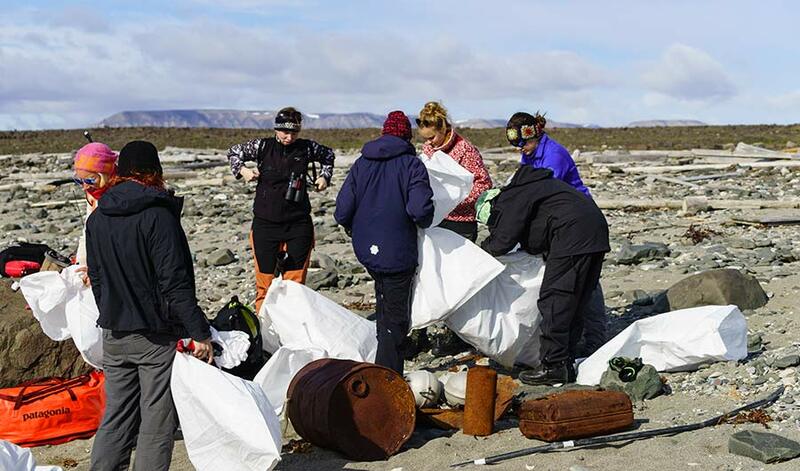 Last summer, citizen scientists collected data on Arctic beach litter, which is detailed in a new study published in Marine Pollution Bulletin. According to the authors of the study, this is the first set of data on litter at remote Arctic beaches. The cruises traveled to six beaches on the Norwegian archipelago of Svalbard, north of the Arctic Circle. As the tourists walked along the beaches, they recorded the weight and type of trash they found. A lookout watched for polar bears. Between 82 and 100 percent of the trash found on each beach was plastic, which is more than the global estimate of 72 percent of all beach litter. The majority of the plastic was fisheries-related -- items such as nets, boat fenders and buoys, mostly from commercial fishing operations. In some locations, all of the plastic on the beach was from fisheries. Fishing activity has dramatically increased in that area in recent years, so it wasn’t surprising that most of the trash was fisheries-related, said Gutow. However, the researchers weren’t expecting to find such a large amount of it. The average concentration of trash found on these beaches was more than 30 times the average amount reportedly found on beaches in South China and India. Tourists also took photos of wildlife amidst the litter. In some cases the litter may have caused injury or death. One tourist found an Arctic tern dead and entangled in a fishing net, but it’s unknown if that's why the bird died. Researchers were surprised at the diversity of organisms that may have been affected by the litter. Some of the more startling finds included the antlers and skulls of reindeer tangled in fishing nets. The tourists also found beer cans from Denmark and a British Petroleum label, but Gutow said it’s impossible to tell when or where the trash originated. The scientists haven't yet developed models to explain how trash reaches the Arctic beaches. Marine pollution expert Kara Lavender Law, a research professor at the Sea Education Association who was not involved in the study, said that citizen scientists could help researchers learn more about the extent of ocean pollution. “When you think geographically of what’s been surveyed across the world’s beaches, we’ve only measured or sampled a small fraction of those places," said Law. "It’s really expensive [for researchers] to get to the middle of the ocean or these really remote regions." Gutow and his colleagues think these findings show that humans impact everything they touch. “It’s not just 'we go there, and we leave, and everything is fine'” he said. “We leave our footprint there whatever we do, and people have to be aware of that,” he said.